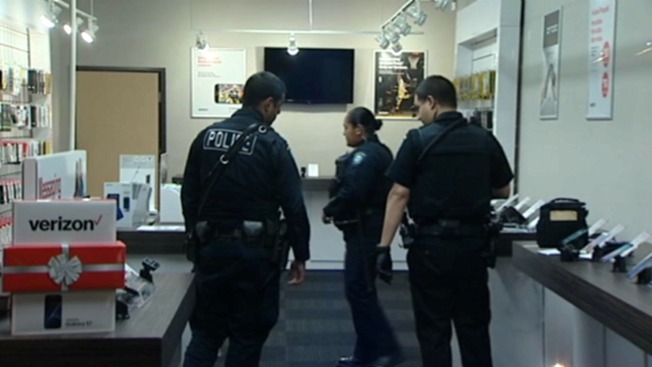 Two suspects, including one armed with a semi-automatic handgun, burst into a Verizon Wireless store in Pacifica on Saturday and stole an undetermined amount of cash and cell phones, police said. The heist took place just before 9:30 a.m. at 80 West Manor Dr. when two suspects entered the establishment and demanded that an employee open a safe. The thieves snatched the items before fleeing in an unknown direction, police said. One suspect is described as being a short male who wore a white bandana on his face, according to police. The other suspect was a taller male wearing a ski mask. Anyone with information is asked to contact the Pacifica Police Department at 650-738-7314. Anonymous tips can be delivered to 650-359-444.